The job of TV travel presenter must surely be a dream job for many, but it also seems pretty unattainable for ‘normal’ people. Last night’s audience with Simon Reeve at Sage Gateshead made the job seem possible even for us lowly folk, given his unusual background. Leaving school without qualifications and admitting to “being a bit naughty” as a young lad, Reeve is not your standard well-educated telly luvvie, and his shows are all the better for it. Reeve approaches places with a wide-eyed wonder which is infectious, and isn’t afraid to ask hard questions. Watching his latest BBC series, Mediterranean, it appears as though he goes into beautiful locations just to ruin them for his audience (in the best possible way, I hasten to add) – where once the historical treasures of Malta lured me, I’m now more aware of a terrifying organised crime syndicate. 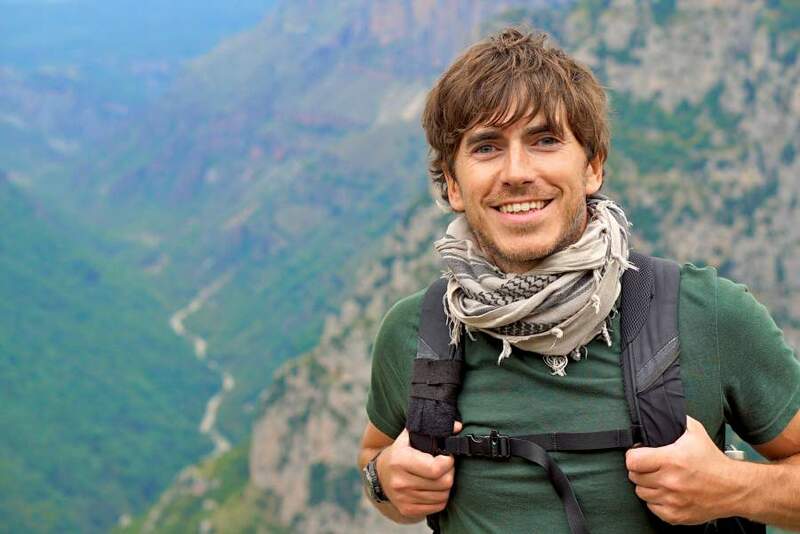 But this is what Reeve does best – his programmes aren’t about an Englishman lovably bumbling around chatting to interesting people; he’s on the frontline in war zones, he investigates environmental issues and asks his audience to step out of their comfort zone. In the three hours Reeve spends on stage he intersperses tales of his childhood (which sounds more like a plot from one of his programmes – alcohol misuse at a young age, hanging out with gangs, getting in trouble with the law, mental health issues) with projected images on a big screen behind him, depicting some of the places he’s visited and people he’s met, and short film clips show outtakes and behind the scenes footage. Along with tales about rising through the ranks at The Times newspaper (where he started out in the post room – yes, such success stories really do happen! ), unwittingly becoming an expert on Al-Qaeda and writing numerous books on terrorism, through to his foray into TV presenting, he talks of some of the 130 countries he’s visited with obvious passion – from Mogadishu to Bangladesh, the Caribbean to the vast Russian wilderness. Most intriguing are tales from the ‘unrecognised countries’, those who don’t have a seat at the UN and who aren’t recognised by the wider world as entities in their own right; such exotic sounding places as Transnistria and Somaliland, which had me itching to add them to my (ever-growing) list of places to visit.